June’s Daring Bakers’ challenge is Bakewell Tart, brought to us by Jasmine of Confessions of a Cardamom Addict and Annemarie of Ambrosia and Nectar. This traditional English tart consists of a sweet shortcrust pastry, which is spread with jam or curd and topped with almond frangipane. The day before this challenge was announced, I had gotten strawberries and rhubarb as part of my weekly Greenmarket haul. I made them into a compote with my morning granola in mind, but after reading the challenge, I knew it would be perfect for the jam component of the tart. This was pretty easily assembled, and tasted great (especially with whipped cream)! 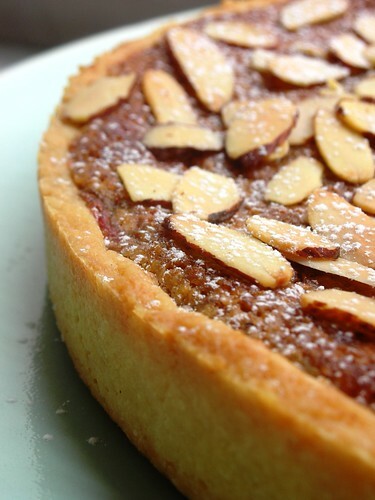 Next time, I’ll use a tart ring with higher sides, so I can fit in more frangipane– I love that stuff! Check out of Confessions of a Cardamom Addict and Annemarie of Ambrosia and Nectar for the Bakewell Tart recipe, and visit the Daring Kitchen site to see what everyone else is up to! Your tart looks so lovely and elegant! Strawberry and rhubarb is such a great combination too. Well done all around! Ohhh, this looks great. Love the filling. I didn’t make my own. What was the height of the tart ring you used? Looks pretty full to me? Love those tart rings. They leave such a great finish. I need to get myself one! I think it’s only about 3/4 inch high. My fluted tart shell has higher sides than the straight one i used here. Next time, I’ll go with the fluted, so I can squeeze in more filling. Your tart looks just great Steph! Nice job on this challenge! The tart looks wonderful. I only discovered you quite recently – hope you are enjoying the US – Sydney is cold and wet! les photos sont superbes 🙂 j’aime vraiment beaucoup ! This looks absolutely heavenly. Great photography. Beautiful! It’s amazing how something as simple as fresh fruit can be so inspiring. I agree with you about the frangipane, I would love to make this in a springform pan just so that I can get more of it. Lovely! I sm sure I would enjoy a slice with strawberries. I’m with you on using a tart ring with higher sides. I wanted to make a whole other batch of frangipane and just bake that by itself. Your tart looks beautiful! Beautiful photos! I made tartlets because I wasn’t sure if I would like these. As soon as I took a bite a regretted that decision. Yours look great! Ooh, whipped cream sounds like a great idea! Your tart looks lovely. This was sooooo good, and sooooo easy. Yours looks and sounds fantastic. I loved the frangipangi too.. Can we eat it with a spoon, like ice cream??? More frangipane is never a bad idea 🙂 And strawberry rhubarb compote is so wonderful. Beautiful job! YUM nicely done! Strawberries & rhubarb – one of my favorite combinations. 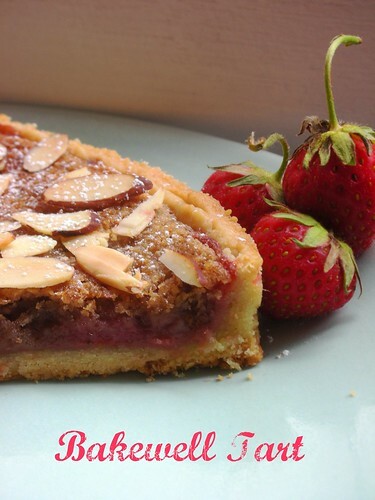 I can imagine the tartness of rhubarb went beautifully with the almond frangipane! Love your tart! It turned out perfect! Your tart is gorgeous! I’ve heard so many good things about the combination of strawberries and rhubarb but haven’t had a chance to try it yet. Your tart looks/sounds DELICIOUS! Love how your photos turned out-so artistic! It looks lovely, and your compote sounds like a great match. Yes, well… as usual… WOW! Lovely photos–glad you liked the challenge. Your tart is gorgeous! I love the name too, I wonder why it’s called “Bakewell?” I’m jealous that you even made your own fruit compote to boot! I really want to try making jams or preserves, especially now that fruits are at their peak. I saw the mason jars and supplies at the supermarket the other day, and they were teasing me! Do you have any great recipes or methods to recommend? I just made about a quart of compote total, so I didn’t bother to “properly” can it. Just put it in the fridge in an airtight container, where it will last for about 2 weeks just fine. I’d reccommend getting a good book on canning (I have one called “Gourmet Preserves” that I like because the author doesn’t use pectin) or visit http://canningusa.com for tips on how to water process. Looks Fantastic! And I agree about Frangipane, I could eat that stuff on everything. simply gorgeous! lovely fruit compote – just perfect! I think I need a tart ring. The results are so pretty. Your pics are gorgeous. Your tart looks gorgeous. I love that you used your own compote. Beautiful, beautiful tart – the inside looks wonderful, the almonds on top look wonderful and I love that perfect side-shot of your crust! So very, very pretty, Steph! That looks so pretty, Steph. This was soooo easy to put together and so good as well. What a lovely tart! Great job! I just got back from London and had this at a local pub ….it was fantastic!